Recently I was thrilled to be invited to speak to the exciting bright minds at Kingston University. 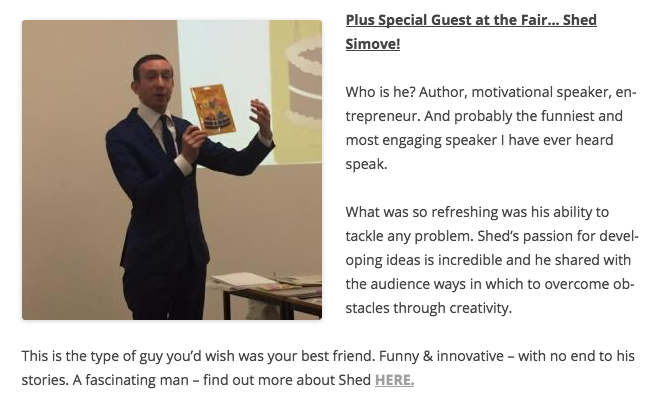 One of the VIP attendees, a fabulous chap called Aaron, wrote a blog about his day, and included a review of my speech on creativity, sales and marketing. You can read his blog by clicking here. It was such a thrill to mix with some of the next generation of business people, entrepreneurs and mover-shakers – and it always excites me how many thrilling possibilities there are for young people – and in fact, for all of us – these days. With the internet at out fingertips, the chance to reach people with what we create is both possible and wildly exciting. And the even more wonderful thing about being young is that you have plenty of time to try, fail, try, fail, experiment, learn and succeed. I wish everyone at Kingston University huge success and a huge thanks to the amazing Staff there, like Dwain Reid, who really care about the students they work with. I read this and thought it might be something for you. The post is called Motivational Speaker, Kingston University, London and is located at https://motivationalspeaker.biz/motivational-speaker-kingston-university-london/.